Being born on April Fool's Day, a day connected with making up stories to amuse and entertain, may have been prophetic in the life of storyteller and author Celia Lottridge. Eldest of three children, Celia was born in Iowa City, Iowa, in 1936. "My family moved a lot when I was young. Until I relocated to Toronto in 1975, I'd never lived anywhere longer than seven years in my life." By age 12, Celia had resided in at least seven communities in five different states. After her father began teaching at the University of Kansas, the family moved to a small community, Oskaloosa, some 40 kilometres from the campus, where they settled permanently and where Celia remained long enough to attend high school. Reflecting on her early "migrant" life, Celia says, "It affected me a lot. One thing it did was turn me into an avid reader. I'm sure I'd have been a reader anyway, but books became my constant friends because my live friends were changing all the time. I gave up really working at making friends when I was going on 10, but books were always there, and so reading and the people in books were very important to me. Another thing was that I got to know a whole lot of different places and kinds of people because sometimes we lived in university towns and other times in small towns where people had completely other kinds of lives. The various communities certainly had a broadening effect on me, but the moving made me kind of isolated." "At 17, I left home to attend Stanford University. I'd gone to such a small high school that I was just dying to learn things, and so I took all the courses I could. About the middle of third year, my advisor said, 'You are going to have to choose a major some time.' As it happened, I had more history courses than anything else, and consequently I graduated in 1957 with a BA in Modern European History." Celia hadn't begun university with clear career goals in mind. "With my mother having been a teacher and my father a professor, plus my liking to read, I probably assumed I'd end up in some aspect of education. In the back of my mind there was the thought that I would write, but I didn't think of it as a career so much as just something I'd do when I was ready. I can recall realizing when I was about eight that every book I read was written by somebody, and I thought, 'If all these people wrote books, maybe some day I could write a book.' I actually could imagine my name on the back of a book in a library, but this was really more like a dream than a plan." Unlike some other authors, Celia did little writing while growing up. "Because I had terrible handwriting and couldn't spell very well, writing for me was exhausting. As a child, I didn't ever write for fun, but I used to make up stories a lot and tell them to my sister who was seven years younger than me and a great listener. I also read stories in books and then told them to her afterwards." "Actually my goal when I finished at Stanford was to get a useful degree so I could work. Because I was a good student, I think I was afraid of getting trapped into going to school endlessly. Libraries attracted me because I loved books, and I thought that librarianship would be a good career." An MLS from Columbia followed in 1959. "I took children's literature from Francis Henne, a great teacher and a true appreciator of children's books as literature. She had real standards and thought the writing of children's books was as important as any kind of writing. I've felt lucky that I came into librarianship before the technological revolution while libraries and librarians' training were still focused on books." Celia's migratory life continued after Columbia for her marriage to a Navy man took her to San Diego where she worked as a children's librarian for a couple of years. When her husband undertook graduate work at Columbia in Russian literature, Celia decided to try working in a school library. "I didn't have teaching qualifications, but I found a job at the Dalton School, a well-known private school in New York's upper east side. I was the Lower School librarian, and that's where I started really telling stories. A progressive school, Dalton taught a lot of art, and there was pressure on the faculty to be creative. Here I was, 25-years- old from a small Kansas town, and I didn't know what to offer in this high powered setting that was creative. I decided that probably no one told these children stories, and so that's what I would do. I got a large amount of practice because every week for three years I told stories to all the elementary school classes. I was self-taught. I read Ruth Sawyer who inspired me, and I guess there was something in me from my early time when I used to tell stories to my sister." The Dalton School was left behind in 1964 when Celia accompanied her husband to Moscow on a 10 month exchange program. "We came back in 1965, and he got a job at Brown University in Rhode Island. There I worked setting up a library in an inner city school and later, after my son was born, as a cataloguer at the university library. After seven years there, we moved to Ithica, New York, where it soon became clear that our marriage had ended. 'Where would I go to live?' became the question, and for a year I went to Boston while I figured out what to do. My brother and his family were living in Toronto, and my son and I went up at Christmas to visit. I thought, 'This would be a good city to bring up a child in.' I didn't really understand that I was moving to another country and that I was probably going to live here for the rest of my life." "Wanting to finally be an accredited teacher-librarian, I went into the University of Toronto's one-year B.ED. program. At first, they were going to make me take the librarian's course, but I managed to convince them that, since I had an MLS, they should let me off. I took elementary education and drama. After graduation, I got a teacher-librarian's job with the Toronto Board, but the Board had totally over-hired. Consequently, at the end of that year, I was laid off along with virtually all the other first year teachers." "I'd only been in Canada two years, and suddenly I didn't have a job. I liked Toronto and felt my son, who was eight, had already been moved enough. Not able to get a job in a library, I went to work at the Children's Bookstore in 1977. This turned out to very fortunate. The bookstore was on the cutting edge of the whole growth of children's literature in Canada, and I was there during this very exciting time. I became the buyer and, as such, got to know practically everybody in the children's book industry. I worked at the store for 13 years, but not full-time the entire period. After a few years, I began writing and doing a lot of storytelling. As these things developed, I gradually reduced my store time from five days a week until, during my last couple of years, I mainly did the store's catalogue. Judy and Hy Sarick were very good to me because they let my job change as my life changed." "My becoming involved in storytelling again was a case of being in the right place at the right time. I met Dan Yashinsky through the bookstore, and, when he and Joan Bodger decided there should be some kind of storytelling organization, I was one of the people they talked to. Consequently, I was on the founding board of the Storyteller's School of Toronto. We started promoting the use of storytelling in schools and being available for schools to book as pure and simple storytellers. Our interest was in spreading storytelling around and not just in being storytellers ourselves. We wanted to teach courses, do workshops, and give children and adults the experience of hearing traditional stories. That kind of mission, one that was beyond our own careers, appealed to me." No longer prevented from writing because of her poor handwriting, Celia found "I was having trouble with the exploratory stage of writing because I had to work full-time. I was also a single parent. What I decided to do was tell publishers that I'd write books that they wanted to have written. Through the bookstore, I was meeting people who were working with publishers on series books. I began writing things like Prairie Dogs, part of the "Nature's Children" series, where you were paid up front, contract work where you didn't get royalties. I did some adaptations of folk tales where there was a translation that needed to be written into better English. I did The Juggler because Ariadne Ochrymovych came into the store with a film and wanted a book. I told her what I'd been doing and ended up writing the book. For that one I actually got royalties. In this fashion, I wrote quite a number of books, some under pseudonyms because the books were part of a series that was all by one author, and, with some, such as the folktales, my credit would be as the adapter. There were two good things about doing these books. One, I earned money up front, something I needed, and, two, I got some experience. By the time The Juggler came along, I really knew I could do it." "About 1983, a publisher who had done an alphabet book asked me to write a counting book, and so I wrote One Watermelon Seed. They liked it but said it had to have coloured illustrations, something that house wasn't then doing. Later I happened to be at Oxford University Press and showed it to Bill Toye who immediately said he'd publish it. That experience led me to the conclusion that it was time to start writing books that I wanted to write." "The Name of the Tree was the first book where I just said, 'I'll write this book myself.'" 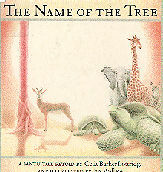 This story about an African drought and the animals' need to discover the tree's name if it was to surrender its delicious fruit was one that Celia had heard read to her as a child. "When I was at Dalton and having to come up with five or six stories a week, I was trying to remember stories I already knew. Recalling this story about the tree and the animals, I started to tell it from memory. Later I began to wonder, 'Where did it come from?' I found the book, but it didn't give the story's origin. I realized that what I'd done was to leave out a lot of details. For instance, in the book, all the animals had names and spoke in rhymes. I thought, 'This really is a folktale, and the person who wrote the book hasn't acknowledged that fact.' It obviously seemed to be an African story, and, through research, I confirmed that it was and that what I was telling was much closer to the traditional than the childhood version I'd heard." "When I told the story, people liked it and asked where they could get it. Other storytellers, having heard it from me, were also telling it. 'Somebody's going to write that story down,' I thought. 'And I'm going to feel very badly if it isn't me.' Since I had told the story hundreds of times, I felt it was already there to be written, but I learned that, when you write stories from telling, a transition has to occur. You just don't write it down the way you tell it, or, if you do, then you have to edit it quite a lot. In this case, I knew the story so well and how I wanted it to sound that, when I went to write it, it wasn't hard to do. Groundwood took it right away." Many years before The Name of the Tree, I'd written a manuscript for another book that was eventually published as Something Must Be Hiding. Patsy Aldana had liked it but didn't think it was 'ready.' Sometimes children ask, 'How long does it take to get a book published?' Well, Something took 10 years between when I first took it to Patsy and when it eventually got published. I think the book's subject comes from my childhood. It's about moving into a new place and not feeling comfortable there. The children who will really respond to the book are older, maybe 8-10. To them, it makes sense that Jenny's trying to feel at home in a new place. She's getting support from her family, but they're busy and don't really have time to figure out why she's imagining these things. On the one hand, I think she doesn't want there to be something under the stairs, and, on the other, she wants there to be something interesting in the house. Because the story is a bit open-ended, some people have found it to be really a good book for discussion. 'What is in the box?'" "I'd always wanted to write a novel, but I never had the time for such a long project. What really made Ticket to Curlew possible was my being Writer-in-Residence at the Regina Public Library for seven months in 1991. I'd had an idea that I'd like to write something based on stories my father had told about when he was young and the family came from Iowa and farmed in Alberta for seven years. My father was a young teenager when they arrived in 1916 and about 20 when they left. Another inspiration was a woman who came to the library in Regina to see me. She had come to Saskatchewan in 1913 at the age of three and was writing about this for her children and grandchildren so they'd know what her experience had been. I suddenly thought, 'People like her have really seen history, from horse farming to hi- tech farming! We should really be writing about these early experiences not only as personal accounts but as fiction so that children can relate to this time in Canadian history. For children, I think that what brings historical fiction alive is a character in the book they feel akin to or have empathy with. Then they can experience the historical part of it. They're not just reading it as, 'Well this happened here back then.'" "Because I was in Saskatchewan, I was able to do some research that would have been much harder in Toronto. Some people do research in a very systematic way. I have a kind of magpie way of researching history, little by little, until it accumulates into a picture. I read a lot of local histories, talked to people and visited historical reconstructions. I went to Provost, Alberta, the town near where my grandfather had had his farm. With that research, plus what I had in my head from hearing from father and my aunts, I was able to write the whole first draft of Ticket to Curlew." 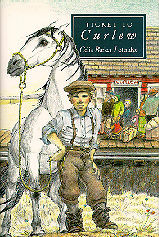 The book, with its episodic plot featuring 11-year-old Sam Ferrier, was both a popular and critical success, being named the 1993 CLA Book of the Year for Children and winner of the Geoffrey Bilson Historical Fiction Award. "For me, the period in Regina was a bit like getting out of a cage in that I suddenly had all this time. While I was there, I also found most of the folk tales I retold in Ten Small Tales. Getting that writer-in-residence position probably made more difference to my writing than almost anything else. It enabled me to expand and move on." Toward the end of writing Ticket to Curlew, I thought, 'If this were about a girl, it would be a different story,' and so I began to think I should write a sequel, but one about a girl. I talked to my aunts and got more information from them which led me into Wings to Fly, which is set in 1918, three years after the events in Ticket. My Aunt Lucille, my father's older sister, still lives in Edmonton. Born in 1902, she was already going to the University of Alberta when the rest of the family went back to the States. I visited her and got her to talk to me about the early days. There had been a time when the 'girls' in the family really didn't want to talk about how they'd lived a fairly subsistence kind of life in a three room house, but, because Aunt Lucille was in her 80's, I guess she didn't care about that so much anymore. She told me some great stories. 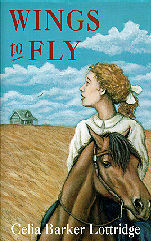 Told from the perspective of Josie Ferrier, 12, Wings is in part my tribute to the women of all kinds who came to the prairies and, with the help of their daughters, did much more than they usually get credit for." Many of the characters and events in Wings have a basis in reality. The female pilot, Catherine Stinson, for example, was a real person who, among other things, flew mail from Calgary to Edmonton. "The silver house, which was based on a house my father had told me about, was empty exactly for the reason I have in the book. The mother of one of my friends from high school in Kansas was born in a sod house in western Kansas, and she had told me a bit about what that was like. The chapter containing the episode with the school board trying to swindle the young woman out of her summer's salary actually happened to my Aunt Lucille. That was one of the stories she told me, and her mother did exactly what happened in the book." In addition to her writing, Celia says that "a big part of my life is the Parent-Child Mother Goose program of which I'm the Director." The program is a social service in which nursery rhymes, songs, and stories are used as a means of improving parent-child relationships. "I work about a third of the time on that, either running it or doing workshops. The Mother Goose program has taught me many things, one of them being how vital it is, with young children, to use language that has rhythm and pattern and interesting images. Ten Small Tales came out of the Mother Goose Program in the sense that I saw how important these stories are because children, from three to six years of age, take them in, make them their own, and, I think, are given patterns in their minds that have some coherence instead of just the random bits that I'm sure they get from watching television a lot. Kids ask, 'What's your favourite book?' and I always reply, The Name of the Tree and Ticket to Curlew, but Ten Small Tales truly embodies something that I believe in deeply and so does the Mother Goose program." In deciding which traditional tales to set to paper, Celia explains, 'I'm mainly interested in putting into print stories that aren't already easily available and usually ones that I've told a lot so that I have a real feeling for the story. For example, I'm not personally very interested in doing, say, another version of 'Sleeping Beauty.' Because most of the stories weren't in English to begin with and I have to rely on other people's versions, what I look for is a story where there are enough other versions that I can sort through them and not just rely upon one. However, there's a point where I just have to say, 'I'm a storyteller, and this is the way I tell the story. I'm not presenting you with the ultimate scholarly version.' I'd only do a story that I, as a storyteller, felt a special bond with. I do have some reservations about lavishly illustrated versions of fairy or wonder tales because I think at times they get overwhelmed by the illustrations. You want a really strong story so that, whatever the illustrations turn out like, the story will stand up for itself. The pictures Ian Wallace did for The Name of the Tree are kind of dreamy, and they balance with the text really well." "My next book is called 'Music for the Tsar of the Sea.' It's a Russian wonder tale that I've retold, and Harvey Chan is the illustrator. I might write a third novel about the Ferrier family. I still have Matt. There's a whole other true family episode about driving a Pierce Arrow to the west coast. While it actually happened in the United States, that's just a detail, and Matt might be the kind of boy who would get fascinated by cars. I'd also like to write something more contemporary. 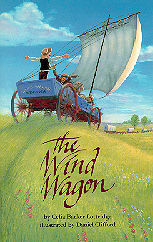 I have a couple of short novels that I've been working on, roughly the length of The Wind Wagon, for children who are just getting into reading chapter books, but effective short novels are hard to write. It's such an important stage of reading. I have a lot of ideas. I still have more ideas than time." The Juggler. With Ariadne Ochrymovych. Scholastic, 1985. Grades 2-6. Mice. With Susan Horner. Grolier, 1985. 0-7172-1903-8. Hardcover. 0-7172-2765-0. Paperback. Grades 3-5. The Name of the Tree. Illus. by Ian Wallace. Groundwood, 1989. 0-88899-097-9. Hardcover. Preschool-grade 4. One Watermelon Seed. Illus. by Karen Patkau. Oxford University Press, 1986. 0-19- 540735-0. Paperback. Preschool-grade 2. Prairie Dogs. With Susan Horner. Grolier, 1985. 0-7172-1939-9. Hardcover. Grades 2-5. Something Might Be Hiding. Illus. by Paul Zwolak. Groundwood, 1994. 0-88899-176-2. Hardcover. Grades 1-5. Ten Small Tales. Illus. by Joanne Fitzgerald. Groundwood, 1993. 0-88899-156-8. Hardcover. Preschool-grade 3. Ticket to Canada. 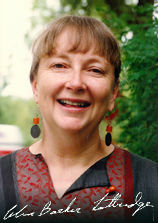 Silver Burdett, 1995. Grades 3-7. The Wind Wagon. Illus. by Clifford Daniel. Groundwood, 1995. 0-88899-234-3. Paperback. Grades 3-6. Wings to Fly. Illus. by Mary Jane Gerber. Groundwood, 1997. 0-88899-293-9. Hardcover. Grades 3-7. *This article is based on an interview conducted in Winnipeg, September 23, 1997.